At least this lesson explicitly claims that the Law is binding on believers. It accurately represents Adventist belief. I, too, will be honest. If you think that keeping the Law will save you initially, that keeping the Law will maintain your salvation or that the Law, and especially the 4th Commandment (Sabbath), is the basis for the final judgment then you probably are lost. Writing it that starkly hurts. It hurts because I remember my own struggle back in the day. I used the word “probably” because I'm not your judge, but I must warn you. I must point you to Jesus. I must declare, as cogently as possible, a different way, the way of grace through faith. In my dark days I thought of myself as the law keeper's law keeper. Truly, I loved the Law. (Actually, I still do.) There is nothing in it that is inconsistent or open to debate. It is clearly stated and impeccably enforced. It is a thing of beauty. Every time I took a step forward I was run over by the 18-wheeler of sin, and then I had to wallow in the slime of shame until I could convince myself that God could forgive me, yet again. I'd pick myself up, change clothes (it doesn't do to show up with shame-slime all over yourself), and take another step forward. And always, ALWAYS, that 18-wheeler crushed me to pulp. I was physically ill with the effort, and the cognitive dissonance was driving me deeper and deeper into depression. I kept at it, trying over and over again to achieve my goal. Years later, someone finally explained to me that I was insane (that is, doing the same thing repeatedly while expecting a different result) at the time. I had to discover that crawling off the freeway of self-effort was the only thing that would save me from being crushed by that sin semi. Thankfully, the Bible actually tells us how this works and points us to Jesus, the author and perfecter of our faith (Hebrews 12:2). Even more thankfully, I met the God who had been reaching out to me the entire time, inviting me to rest in his arms. In his mercy he protected me from physical death. In his grace he did infinitely more – he saved me! This lesson has nothing to offer in terms of a changed life. It can only cause you to realize your complete inability to do anything God wants you to do. However, there is hope. There is a way out of this debacle, and his name is Jesus. Let's start with the partially quoted passage in the quarterly, Matthew 5:17-18. Of course Jesus did not come to abolish the Law or Prophets. In his own words, he came to fulfill the Law and Prophets. Notice also his next statement – nothing would pass from the Law until all was accomplished. How much of the Law did Jesus accomplish? If you answer anything other than ALL of it, then you are believing a lie. If Jesus accomplished the whole Law, how much of it is left to keep? If you answer anything other than NONE of it, then you are believing a lie. How is this not a license to sin? First, you must understand the difference between sin and sins. Sin is anything that does not come from faith (Romans 14:23 – It is fascinating that the context of this verse regards eating food that some find offensive.) This means that all my behaviors, good or bad, are sins if they are done in my own strength, wisdom or ability. Fundamentally, sin equals unbelief in Jesus. Sins are those actions, whether they look good or bad to the outside observer, that flow from unbelief. Adam and Eve's sin in Eden was unbelief in God. They took Satan's word over God's. Eating the fruit was the natural result of sin, the visible symptom of an internal, invisible root cause. Second, Jesus died in triumph over sin. He became sin, without ever being sinful, so that we could be the righteousness of God (2 Corinthians 5:21). This reality is not Law based, but relationship based. In short, God himself has taken on the responsibility of teaching us, working from the inside out what could never be worked from the outside in. This can only mean that if you insist on putting yourself under Law, regardless of the pretty words used to justify the legalism, then sin is your master. Let me repeat that. If you put yourself under Law, then sin is your master. He expounds on this reality in the famous Romans 7 passage. Obviously, no one has been given a license to sin. This is a straw man posited by legalists to justify their own failures. The real problem with Adventism is idolatry. You can get away with almost anything as long as you “keep” the Sabbath. Jesus said, “For I say to you that unless your righteousness surpasses that of the scribes and Pharisees, you will not enter the kingdom of heaven.” (Matthew 5:20 NASB) No Adventist has ever kept the Law like the Pharisees. Jesus exposed their idolatry. Will he do anything less with modern-day Pharisees? The Adventist position truly is antinomian because they try to force the Law to be something it is not. There is no indwelling Holy Spirit. Listen to their double-talk. No one can be saved by keeping the Law. At the same time, no one can be saved without keeping the Law. Which is it? It can't be both. Finally, what was Jesus' relationship to the Law. Paul tells us explicitly in Galatians 4:4-5. Jesus was born under Law. He lived under Law. He died under Law. You and I are not under Law. Period. Read Romans 6:14 again. I might also suggest looking up Law in a good concordance. Follow its use throughout the Bible. Read about it in context. The lesson's author trots out the infamous license-to-sin straw man in order to scare people into keeping the Law. The Bible clearly teaches that no such straw man exists, except in the mind of the legalist. The only way to say No to ungodliness is by grace; that is, by the indwelling Holy Spirit. Only in an Adventist mind could Jesus' statement raise this question. The answer really is simple. Jesus said this was a new command because it was a new command. Previously, he had perfectly summarized the Law – Love God with all your mind, soul and strength; Love you neighbor as yourself. Something was about to change. The disciples didn't understand what exactly, but they knew something was up. Jesus was about to die. His death would usher in the New Covenant promised in Jeremiah 31. This new covenant is not law based. Rather, it is relationship based. Yes, God promised to write his law on our hearts, but this is a promise that the indwelling Holy Spirit (see Titus 2 again) would do things for us by renewing our minds, purifying our wills and sanctifying our emotions. No one could love others as they had been loved UNTIL the Holy Spirit came at Pentecost. Does this mean that God did not love people before the New Covenant? No. It means that the sin problem prevented the kind of relationship he desired to have with us. Jesus provided the solution. Don't try to force Jesus to say things he didn't say. He didn't say that we were to love as we have been loved as-long-as-we-keep-the-Law-perfectly-all-the-way-through-to-the-end-of-time-even-after-the-Holy-Spirit-is-taken-away-and-we-must-stand-on-our-own. Jesus simply said he was giving a new command. Actually, Paul was not emphasizing Law. He was emphasizing his willingness to reign in his own freedom in order that he would not be a stumbling block to anyone he met. For Paul, everything was about bringing people to Jesus. Their backgrounds didn't matter. Their belief systems didn't matter. He was conversant with all of them, both by training and by inspiration, so he could mingle with folks in complete comfort. Compare his approach to the agitators that followed him from place to place. As soon as Paul had introduced people to Jesus, these Judaizers would start fomenting for circumcision, law-keeping, sacrifices and the like. To them, Jesus was never enough. Paul's response? Just go ahead an emasculate yourselves (see Galatians 5:12). Did Paul hate the Law? Absolutely not! He celebrated his Jewish heritage. His trip to Rome was precipitated by his fulfilling a vow at the temple in Jerusalem. But Paul, after his conversion, was never under Law again. Paul did not emphasize Law in 1 Corinthians 9. Paul emphasized careful, Spirit-led evangelism in 1 Corinthians 9. The Law has but one purpose. You are no friend of mine if you find me trapped in a sin and transport me “back to the arena of God's law of love.” The Law is good only for pointing out that I do not and cannot live a righteous life. If I am trapped in sin there is a good chance that I am already acutely aware of my sinfulness. The only answer to this, and the only loving thing to do, is to bring me to Jesus to, perhaps for the first time, discover what it means to live in the reality of ongoing forgiveness and the absolute assurance of eternal life in him. “the curse has been reversed by the gift of eternal life, which has been made available through the life, death, and resurrection of Jesus Christ.” (Standard Edition Quarterly, Page 68). 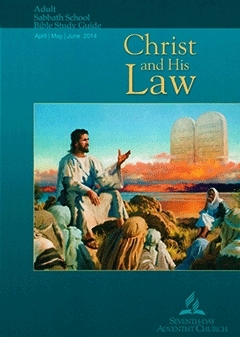 “In other words, the person who has sinned should be encouraged to abide once again by the precepts of God’s law.” (Standard Edition Quarterly, Page 68. If you help me back to the Law you are, in effect, dooming me to an ongoing curse. Thank you, no. I'll pass on that opportunity. Restoring someone trapped in sin is not an exercise in taking them back to Law. If the person is not saved, then it is far more important to introduce them to Jesus than to remind them that they're breaking one of the commandments. Honestly, does anyone out there think measuring the level of love that you have shared with God and humanity, using the Law as the yardstick, will result in anything but being consigned to the raging fires of hell? This is the height of folly! Over and over again the Law has been described as demonstrating only that we are incapable of behaving as God intends. This role is absolutely crucial in our lives and serves to drive us to Jesus for salvation, but once faith comes we are no longer under the tutor (see Galatians 3:23-25). Besides, the final judgment is NOT for children of God. The final judgment is reserved for “the dead,” those who have rejected Jesus. See Revelation 20:11-15. Children of God are privileged to stand before the Bema Seat to learn how their faith in Jesus resulted in works made with gold, silver and precious stones (see 2 Corinthians 5:10, coupled to 1 Corinthians 3:10-15). There will be no questions regarding one's ability to keep the Law. Space does not permit a full explanation of the basis for judgment. Let me assert the answer and invite you to do some meaningful study on your own. Here's the answer: No one who has accepted Jesus as Lord can be lost. No one who has not accepted Jesus as Lord can be saved, regardless of his or her good behavior. Thursday's lesson gets down to Adventist nitty-gritty. When it's all said and done, God is going to measure your Save-ability by your Law-ability. According to this definition, everyone, absolutely everyone, will be lost. According to Adventist theology, you are saved by grace initially, but you need to keep the Law perfectly thereafter (or make certain you're all 'fessed up) in order to maintain your salvation. I will accept no church discipline from a legalist. This is a matter not of pride, but of self-preservation. On the other hand, I am eternally grateful for the discipline I've received from Spirit-filled, grace-informed siblings in Christ. Not that grace is an easy road. On the contrary, being told the truth can hurt, but truth sets us free. Here's the deal with Law. Abraham was promised that all the world would be blessed by his Seed. We know, based on Paul's words in Galatians, that this Seed is none other than Jesus Christ. Through whom did this promise come? First, Abraham. Then Isaac. Then Jacob (not Esau). To which of Jacob's (Israel's) sons was the promise given? The promise was given to Judah. By definition, then, the entire Mosaic Covenant and its Levitical Priesthood was a limited, temporary situation. There is no doubt that it was a God-given situation, but it was given to be superseded. It was but a shadow. The reality is found only in Jesus. See Colossians 2:16-23. Jesus is our new High Priest, and no one from the tribe of Judah could be one of those. Therefore, when there was a change in the priesthood, there must be a change in the Law. I invite you to read Hebrews 7 for yourself to get a picture of how much things have changed. Adventism, if followed to its logical conclusion, denies this truth, substituting instead a religion of self-effort. The result will be loss. This is the greater tragedy. I believe most Adventists are truly sincere. Unfortunately, sincerity means nothing to God. He is interested only in truth. Jesus is the truth, and Adventism rejects Jesus. The problem is not sincere Adventists. The problem is Adventist leadership who knows better, but will not admit the bankrupt nature of the belief system they foist on their people. Will they change? No. They are too invested in their system. But they have no real power over individual Adventists. Anyone can at any time open the Bible and read for themselves what Jesus has done, and continues to do, on their behalf. Anyone can at any time let go of the traditions that bind them to legalistic failure. Anyone at any time can accept Jesus and be held in his hand, completely safe and secure in him. Now is that time! Let Jesus overwhelm you with his love and grace. Copyright 2014 BibleStudiesForAdventists.com. All rights reserved. Revised May 14, 2014. This website is published by Life Assurance Ministries, Camp Verde, Arizona, USA, the publisher of Proclamation! Magazine. Contact email: BibleStudiesForAdventists@gmail.com.